From the IEP Wizard Quick Resume Menu, select IEP Wizard Course of Study. 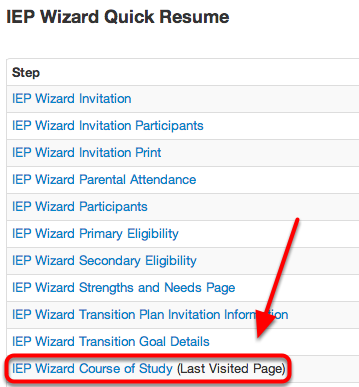 Hint: The IEP Wizard Course of Study link will ONLY appear If the student has a transition plan AND the Transition Goal Details section has accurately been completed. 1. 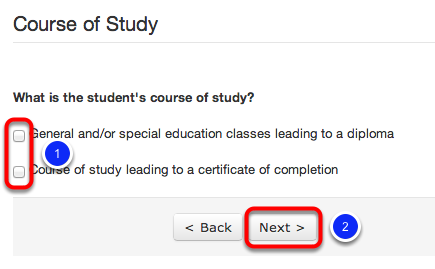 Indicate the student's Course of Study by clicking the appropriate check box. 2. Click Save or Next to ensure that your data has been saved. Note: By clicking Next or Save you will be redirected to the IEP Wizard Student Rights portion of the IEP. Once you have successfully completed the Course of Study section you are now ready to complete the Student Rights portion of the IEP. Please see the "Complete Student Rights" lesson in this manual for more information on how to complete the Student Rights section of the IEP.